Thank you, brother. In the hidden part of ourselves comes the truth even when we can’t feel it. It is so easy to be numbed by the covering of our civilization. Thank you for keep reminding us of that inner place with in us. Hidden by the Dawn you embrace on the beach of your day….INDEED! Welcome our new day in this Dawn with all the LOVE we share. 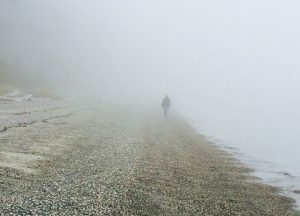 A needed reminder to focus on “the original self”…like the fog in the photo, diffuse yet pervasive. Thank you for another deeply stirring poem, Don. Now this is most excellent Don – and with your poem comes delight in oneness with this star that guides so that I may see and know by night, even in deepest sleep, and awaken, strengthened, within the same great sky that holds both morning sun and evening star. Sending Love & Light your way. Give thought to that guiding star and NOT to the tumult of the world…..
Don, You have a habit of describing my most interior journeys. Thank you from my deepest heart. Indeed, the body does become more fragile as we age, yet the beauty of the Morning Star, and all it represents, shines ever more beautifully, more clearly. Thank you, Don. Ahhhh, that is such a beautiful description. Wishing you a wonderful holiday, Don. Thanks for this one Don. Welcome after the winding down of the holiday and contemplating a return to the day to day routine. A heartfelt and mind awareness of who I am, in the midst of the shadows, is what this lovely poems indicates to me. Our passion for the star that guide and animates us, is ever present. Thank you, Don! This is so beautiful. I am amazed at your continuing ability to find the complex in a ‘cup of coffee, a piece of toast’. You’re right, it is that simple, yet so very vast. I love the depth you share with us, thank you.